This article is about guitars with six courses. For guitars with more than six separate strings, see Classical guitar with additional strings. An acoustic 12-string guitar: the Yamaha FG720S-12. The 12-string guitar is a steel-string guitar with 12 strings in six courses, which produces a richer, more ringing tone than a standard six-string guitar. Typically, the strings of the lower four courses are tuned in octaves, with those of the upper two courses tuned in unisons. The gap between the strings within each dual-string course is narrow, and the strings of each course are fretted and plucked as a single unit. The neck is wider, to accommodate the extra strings, and is similar to the width of a classical guitar neck. The sound, particularly on acoustical instruments, is fuller and more harmonically resonant than six-string instruments. The headstock is elongated to accommodate 12 tuning machines. The added tension of the six additional strings necessitates stronger reinforcement of the neck. The body is also reinforced, and built with a stronger structure, to withstand the higher tension. The fretting scale is generally shorter to reduce the overall string tension. Twelve-string guitars are made in both acoustic and electric forms. However, the acoustic type is most common. The double ranks of strings of the 12-string guitar produce a shimmering effect, because even the strings tuned to unisons can never vibrate with precise simultaneity—that is, they vibrate out of phase. The result to the ear is a sound that seems to "shimmer", which some describe as resembling strings that are slightly detuned. The interference between the out-of-phase vibrations produces a phenomenon known as a beat that results in a periodic rise and fall of intensity that is, in music, often considered pleasing to the ear. Pete Seeger described the distinctive sound of the 12-string guitar as "the clanging of bells." The origin of the modern 12-string guitar is not certain, but the most likely ancestors using courses of doubled strings are some Mexican instruments such as the guitarra séptima, the guitarra quinta huapanguera, and the bajo sexto. At the end of the 19th century, the archtop mandolin was one of the first instruments with courses of doubled strings designed in the United States. In the 19th and early 20th centuries, 12-strings were regarded as "novelty" instruments. The 12-string guitar did not become a major part of blues and folk music till the 1920s and the 1930s, when their "larger than life" sound made them ideal as solo accompaniment for vocalists, especially Lead Belly and Blind Willie McTell. The 12-string guitar has since occupied roles in certain varieties of folk, rock, jazz, and popular music. Lead Belly's protegé, Fred Gerlach, brought the instrument into the folk-music world. Initially, it was primarily used for accompaniment, owing to the greater difficulty of picking or executing string "bends" on its double-strung courses. In the later 20th century, however, a number of players devoted themselves to producing solo performances on the 12-string guitar. A reissue of the 1964 Rickenbacker 360 12 String guitar. Electric 12-strings became a staple in pop and rock music in the 1960s. Early use of the instrument was pioneered by the guitarists of The Wrecking Crew; in 1963, Carol Kaye used a converted Guild six-string on The Crystals' hit "Then He Kissed Me," and on Jackie DeShannon's song "When You Walk in the Room," Glen Campbell played a well-known guitar figure, composed by De Shannon, on an electric twelve. One of the first mass-produced electric 12-strings was the Bellzouki. Introduced by Danelectro in 1961, from a design by session guitarist Vinnie Bell, it was initially considered a cross between an electric guitar and a bouzouki rather than an electric version on the traditional 12-string guitar. In the UK in 1963, JMI briefly produced the Vox Bouzouki, later produced in Italy as The Vox Tempest XII, which was used by Vic Flick on the Peter and Gordon hit single "A World Without Love" in 1964. In late 1963, Burns developed the Double Six, supplying a prototype to Hank Marvin of The Shadows, who used it on a number of songs for the soundtrack of the 1964 Cliff Richard movie Wonderful Life; the Double Six was also used on The Searchers' cover version of De Shannon's "When You Walk In The Room." The electric 12-string gained prominence with the introduction in 1964 of the Rickenbacker 360, made famous through George Harrison's use of it on The Beatles' album A Hard Day's Night and many subsequent recordings. In 1965, inspired by Harrison, Roger McGuinn made the Rickenbacker 12-string central to The Byrds' folk rock sound, further popularising the instrument. By the mid-Sixties, most major guitar manufacturers were producing competing instruments, including the Fender Electric XII (used by Roy Wood of The Move), and the Vox Phantom XII (used by Tony Hicks of The Hollies). Gretsch, Guild, and Gibson also produced electric 12-string models from the mid-Sixties and following decades, with Gretsch promoting theirs by supplying number of custom made 12-strings for The Monkees guitarist Michael Nesmith, for use on The Monkees' TV series. Jimmy Page onstage in Chicago with Led Zeppelin, using the Gibson EDS-1275 double neck guitar. Standard electric 12-strings became less popular with the end of the American folk rock scene in the late sixties; Fender and Gibson ceased production of the Electric XII and ES-335 12-string variant respectively, in 1969. 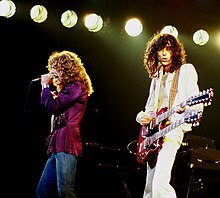 However, from the 1970s, some progressive rock, hard rock, and jazz fusion guitarists, most notably Jimmy Page of Led Zeppelin, John McLaughlin of The Mahavishnu Orchestra, and Alex Lifeson of Rush, used double-necked guitars such as the Gibson EDS-1275, with six-string and 12-string necks, for live appearances, allowing easy transition between different sounds mid-song. The post punk era saw a resurgence of electric 12 string guitar use among sixties-influenced alternative rock, pop, and indie guitarists. Players such as Johnny Marr of The Smiths, Dave Gregory of XTC, Susanna Hoffs of The Bangles, Marty Willson-Piper of The Church, Peter Buck of R.E.M., and Tom Petty and Mike Campbell of the Tom Petty and The Heartbreakers often chose 12 strings (particularly Rickenbackers) for many songs. The strings are placed in courses of two strings each that are usually played together. The two strings in each of the lower four courses are normally tuned an octave apart, while each pair of strings in the top two courses are tuned in unison. The strings are generally arranged such that the first string of each pair to be struck on a downward strum is the higher-octave string; however, Rickenbacker usually reverses this arrangement on its electric 12-string guitars. The tuning of the second string in the third course (G) varies: some players[who?] use a unison string, while most prefer the distinctive high-pitched, bell-like quality an octave string makes in this position. Another common variant is to tune the octave string in the sixth (lowest) course two octaves above the lower string, rather than one. Some players[who? ], either in search of distinctive tone or for ease of playing, remove some doubled strings. For example, removing the higher octave from the three bass courses simplifies playing running bass lines, but keeps the extra treble strings for the full strums. Some manufacturers[who?] have produced 9-string instruments based on this setup, in which either the lower three courses are undoubled, or the upper three courses are undoubled. The extra tension placed on the instrument by the doubled strings is high, and because of this additional stress on their necks and soundboards, 12-string guitars long had a reputation for warping after a few years of use. (This is less of a problem in modern instruments, built after 1970.) Until the invention of the truss rod in 1921, 12-string guitars were frequently tuned lower than the traditional EADGBE to reduce the stresses on the instrument. Lead Belly often used a low-C tuning, but in some recordings, his tunings can be recognized as low-B and A tunings. Some 12-string guitars have nontraditional structural supports to prevent or postpone warping, at the expense of appearance and tone. For additional reduction of the stress of the added string tension, 12-string guitars built prior to 1970 typically had shorter necks and fretboards than six-string guitars did, and their fretting scales were also shorter, which meant that the fret positions were more closely spaced, as well. Their bridges, especially in acoustic guitars, had a larger reinforcement plate for the same reason. Advances in the materials, the design, and the construction techniques used for such guitars that were made following 1970 have rendered most of these accommodations moot in more modern times, and contemporary 12-string guitars are commonly built to the same overt design and scale as their six-string counterparts. The most common tuning, considered standard today, is E3•E2 A3•A2 D4•D3 G4•G3 B3•B3 E4•E4, moving from lowest (sixth) course to highest (first) course. Lead Belly and some other players have doubled the lowest course two octaves above instead of one, producing a third string in unison with the top course. Some performers use open tunings and other non-standard guitar tunings on 12-string guitars. Some performers have experimented with tuning the two strings within a course to intervals other than octaves or unisons: jazz guitarists such as Ralph Towner (of Oregon), Larry Coryell, and Philip Catherine have tuned the bass courses of their 12-string guitars to the upper fifths and trebles to the lower fourths instead of octaves and unisons; Michael Gulezian tuned strings in the top two courses to whole-tone intervals (and possibly some of the other strings an octave lower) to achieve a very rich, complex sound. The greater number of strings offers almost endless possibilities. Nashville Tuning refers to a way of simulating a 12-string guitar sound, using two six-string guitars playing in unison. This is achieved by replacing the lower four courses on one six-string with the higher octave strings for those four courses from a 12-string set, and tuning these four strings an octave higher than normal tuning for those courses on a six-string. Double-tracking this guitar with the standard-tuned six-string is commonly used in recording studios to achieve a "cleaner" 12-string effect. The 12-string guitar's greater number of strings and higher cumulative string tension complicates playing, in both hands. Fretting chords requires greater force, and the width of the neck and the added string tension combine to make soloing and string-bending challenging. The gap between the dual-string courses is usually narrower than that between the single-string courses of a conventional six-string guitar, so more precision is required with the pick or fingertip when not simply strumming chords. Consequently, the instrument is most commonly used for accompaniment, though several players have taken the time to develop the 12-string guitar as a solo instrument. Flat-picking solos are more frequently seen with electric players, whereas a few acoustic players, such as Leo Kottke, have adapted fingerstyle techniques to the instrument; players such as Ralph Towner have applied classical playing techniques. ^ Simmons, Michael. "The origins of Twelve String Power". frets.com. Acoustic Guitar Magazine. Retrieved 16 January 2019. ^ Tolinski, di Perna (2016). Play It Loud: An Epic History of the Style, Sound, and Revolution of the Electric Guitar (Hardcover ed.). New York, NY: Knopf Doubleday Publishing Group. ISBN 0385541007. Retrieved 16 January 2019. ^ Bogdal, John. "12-String Guitar: From the Street to the Stage". Stringjoy.cm. Stringjoy, LLC. Retrieved 16 January 2019. ^ a b "FRETS.COM". www.frets.com. Archived from the original on 6 May 2018. Retrieved 6 May 2018. ^ a b See, Derek; "1930s Stella 12-String"
^ The guitarists who so devoted themselves included Leo Kottke, Peter Lang, John McLaughlin, Larry Coryell, and Ralph Towner, among others. ^ Moseley, Willie G. (2000). "Carol Kaye interview in Vintage Guitar Magazine". ^ a b c Bacon, Tony (2010). Rickenbacker Electric 12 String: The Story of the Guitars, the Music, and the Great Players. ^ Ohara, Marcus (2010). "The Bellzouki aka The Danelectro 12 String Guitar". ^ Mitchell, Ed (2010). "B is for... Bellzouki". ^ "Vox Bouzouki Electric Twelve String Guitar". www.vintageguitarandbass.com. Retrieved 22 February 2019. ^ Songfacts. "British Session Star Vic Flick : Song Writing". www.songfacts.com. Retrieved 22 February 2019. ^ "Double Six Guitars London". www.burnsguitars.com. Retrieved 22 February 2019. ^ "Hank's Guitars |TVS Specialty Products". www.tvsspecialtyproducts.com. Retrieved 22 February 2019. ^ Fanelli, Damian R (17 April 2017). "The Beatles' Secret Weapon: George Harrison's 1963 Rickenbacker 360/12". Guitar World. ^ Beinstock, R (14 December 2014). "Guitar Collection: Roger McGuinn's 1964 Rickenbacker 360-12". Guitar Player. ^ Allen, Frank (2016). "The Rickenbacker Myth (The Searchers' Official Site)". ^ "The Monkees Instruments and Gear". Monkees Live Almanac. Retrieved 29 October 2018. ^ Owens, Jeff (19 May 2017). "Ring True: A History of Fender 12-String Electric Guitars". www.fender.com. Retrieved 22 February 2019. ^ "1968 Gibson ES-335-12 | True Vintage Guitar". truevintageguitar.com. Retrieved 22 February 2019. ^ "Johnny Marr's Gear". Retrieved 22 February 2019. ^ "Chalkhills: "XTC: The Reluctant Gods Of Smart Pop", Guitar Player, 1992". chalkhills.org. Retrieved 22 February 2019. ^ Sollenberger, Kraig (10 October 2006). "Susanna Hoffs". Vintage Guitar® magazine. Retrieved 22 February 2019. ^ "News". www.rickenbacker.com. Retrieved 22 February 2019. ^ "Tony Bacon: books, words, and more". Retrieved 22 February 2019. ^ See Julius Lester/Pete Seeger The 12-String Guitar as Played by Leadbelly, Oak Publications, New York, 1965, p. 6. ^ In his book Steel-String Guitar Construction, artist and luthier Irving Sloane devoted a chapter to the 12-string guitar which did not mention the subsequent advances.